Chin Implant Surgery is a minimally-invasive, safe alternative to genioplasty surgery that strengthens a retrusive chin, and improves the appearance of your chin, jawline and neck. Neck Liposuction may be performed at the same time if you have unwanted deposits of fat. Chin Implant surgery is performed through a small, inconspicuous incision under your chin, and your operation takes around a half hour. Chin Implant Surgery may be performed with local anesthetic, and most patients resume normal social activities in around a week. Dr. Joseph offers Neck Liposuction Surgery to safely remove unwanted fat from your neck and jowls, and is commonly performed to permanently reduce a double-chin. If your neck appearance is bothersome, Neck Liposuction Surgery may be a more predictable and cost effective alternative to Kybella (deoxycholic acid injections). Dr. Joseph's innovative liposuction techniques can produce outstanding, beautiful results with less swelling and a shorter recovery period. Your neck may be a repository for unwanted fat, removal with liposuction is performed through a tiny incision with local anesthetic, with or without IV sedation. Neck Liposuction may also tighten and lift your neck skin for a youthful rejuvenated appearance. Downtime is around a week, and un-operated, completely natural results are the norm in appropriate patients. While Neck Liposuction can be performed alone, it is commonly combined with Chin Implant surgery to enhance your results and improve the contour of your jawline. Both Chin Implant surgery and Neck Liposuction may be offered with Rhinoplasty surgery for a balanced and attractive facial profile. 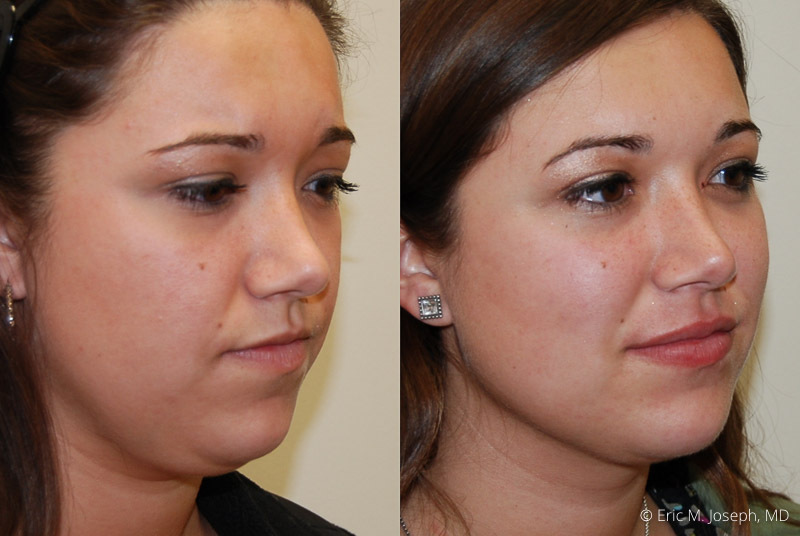 If you are interested in Chin Implant surgery or Neck Liposuction, please Contact Us today.